Gentoo Forums :: View topic - [SOLVED] KDE Plasma 5 - problem with mount - polkit? [SOLVED] KDE Plasma 5 - problem with mount - polkit? Oh, that problem! Sorry, I'm already used to it so didn't think about that. The green tick on the right. Click that and it opens in Dolphin. so I assume that the "plug" icon on the right corresponds to your green checkmark. If I try to click that, it just gives me the same mounting error as before (after I comment out my polkit rules). 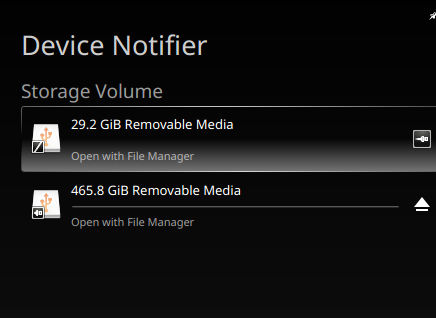 If I reinstate my polkit rules (given above), then that plug icon acts like the "Open with File Manager" text on the left. Will fiddle with my settings later after work and see if I can reproduce your views. Okay, I set my desktop theme to Oxygen, and now when I hover over the tick mark, there is a popup telling me to click it to mount the flash drive. Clicking it causes Dolphin to open. I went back to Smoother 5, and the behaviour is different.. this time I did notice popup, but clicking the tick just gives the summary graph of the drive... it does not fire Dolphin. I switched to Breeze desktop theme and same behaviour as Smoother 5, which is odd as Breeze is default for Plasma 5. FWIW I'm on stable branch of Plasma. I also recompiled kde-apps/kdebase-kioslaves last night which pushed the version from 15.08.1 to 15.08.3 (IIRC), I don't know if that had any effect. Tried Air, same result. Went back to Oxygen, and now it also works like the others, and does not fire Dolphin until I click on the graph. Conclusion: this subsystem is still buggy. Sweet lord, what were the KDE devs thinking? This is bloody obtuse. I just tested this on new amd64 stable system and Plasma 5.5.5 (previously ~amd64 & Plasma 5.6.2), the same problem - no access to any memory sticks or cards for ordinary user - so doesn't matter you use amd 64 or ~amd64. Is there any solution for Gentoo users without manually changing polkit files? I tested KDE Mint and Kubuntu and those systems works just fine. @Xywa: Please specify what issue you have exactly. How do you mount your media, do you click on the green icon in the device notifier and it does not work? Have you finally fixed your consolekit session (I remember you had wrong session information in ck-list-sessions)? @Xywa: Please specify what issue you have exactly. How do you mount your media, do you click on the green icon in the device notifier and it does not work? Have you finally fixed your consolekit session (I remember you had wrong session information in ck-list-sessions)? ^^ I could make a photo if you wish. Should I add myself to the console group? I am already in polkitd group as I thought it might help. Yes, but this being a forum thread you could read the last few messages, does it work when you click on the green tick icon on the right? the checkmark, it work fine. so when I click on the check mark I get a popup that asks me for my password and then it mounts the device. I don't know if this will help anybody. Confirmed working here : click the "tick", and THEN click the "device" ... it showed a small map of available space and space used on the device. I did not get asked for my password. Possibly the whole "plugdev" thing affects that, but I never got asked in KDE4 either. This is not a very obvious user interface change.... they should at least put a hover dialogue over the tick, and another over the rest of the field, telling what to do. And fix that useless error message. Agreed! This is just RIDICULOUS and quite frankly p*ssed me off. Wasted an afternoon trying to sort this out and turns out to be a sh*tty UI design . It's a bug, not intentional UI design. KDE asked me for a root password and I could mount memory card!!! but when I click on this small thing it works!!! I have added the two files, Pistos told here, to the system. That removes the 'An unknown error occured - NOT autorized...' - warning. Maybe after a re- login btw. X restart it will work to manage the devices over the knotifier (?) I'll see. On the (most stable) Kernel 3.16.1 I had before, it all worked nicely! The problem, that I can't mount over the Human User Interface, (afaik; KDE) firstly came, when I updated to kernel 4.4.6! Also I do still use the unmaintained KDE4 and not the Plasma5. There, I*ve heared of, strange behavior. So long. Thank you guys for the solution, it is definitely a bug that the device mounter is unable to mount it and you have to click on that little icon to call a dolphin. Not likely. The issue was present well before 5.6 already. Thanks @feniksa, your solution worked for me. I solved the problem [for my system]! Many thanks, I've been trying to solve this for quite some time! Works beautifully! In my case, the problem was that I was trying to mount an exFAT filesystem, but didn't have sys-fs/fuse-exfat installed (I've only had this box dual-bootable (Gentoo and Win10) for maybe a month and have installed packages as I've needed them). The error message returned by KDE obscured the nature of the problem by making it look like some sort of permissions error; it should've said something about not having support for the filesystem on the device. Once fuse-exfat was installed, it worked like a champ.